Leslie Green and his Ginger crew pulled off the ultimate class feat when they sailed to a fourth successive MC38 Australian Championship on Pittwater on Sunday February 19, 2017. A fickle last day closed up the final pointscore. Ginger (CYCA) laid the foundations in the first two days and went out to race defensively, putting a target on Dark Star’s (RPAYC) back, and Neville Crichton’s Maserati (RNZYS/CYCA) crew cleverly read what breeze there was to move into second overall. The day opened with a patchy 5-7 knot sou’west wind for race eight and finished with a second race, on the Mackerel Beach to Stokes Point course in a light ESEer up to 8kts with a mid-section full of holes. A weather system to the north-west did Pittwater sailors no favours and forced a postponement between races as the committee monitored the Bureau of Meteorology’s radar for thunderstorm activity, wary of the previous two afternoon’s sudden storms. “It was a hard day today, we had to cover Dark Star and that can lead you into trouble,” Green said. “All the boys are so good, the reason we win is we have an excellent team. I loved every minute of it and I’ll be back next year,” the smiling skipper promised. 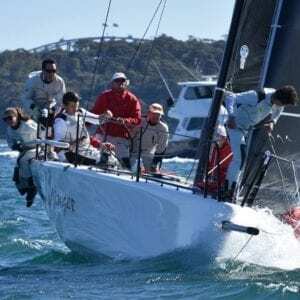 Cameron Miles, tactician on Dark Star, rued yet another final series day when their good fortune ran out, similar to the final day and race of the 2016 Australian Championship. “The last day seems to not be our day. We are sailing well and the boat’s going well, we just need to be more consistent. We could have got our time on distance better in the second start, the penalty turn didn’t hurt us as we were going right but then the breeze came in hard out of the left. You can only go with what you can see at the time,” Miles added. Being the tactician on a cloudy and shifty Pittwater is the most unenviable job on the boat, no matter which class, and what happened to Dark Star and others today is referred to by locals as ‘being Pittwater-ised’. Sunday’s race victories went to Maserati and Chris Hancock’s Vino while Steve Barlow’s Light Speed again posted promising results, finishing fourth in their debut MC38 regatta – a national title nonetheless. On Light Speed’s heels was Marcus Blackmore’s Hooligan, tactician Will Ryan making some smart calls in the taxing conditions.